This disc is a compilation of three recordings which have been released previously. The inclusion of a cantata by Christoph Bernhard is a bit odd, as he belongs to a different generation. In addition the acoustic circumstances of that recording differ from the rest. But this is really the only point of criticism about this disc which I otherwise don't hesitate to call perfect. Telemann was one of the most prolific composers in Germany in the 18th century. It is mostly his chamber and orchestral music for which he is famous. But he also wrote a large number of sacred works, either for private use or for the liturgy. If one wants to select music for Christmas there is a lot to choose from. For the first Christmas day alone about thirty cantatas are extant. Two of them have been selected for this disc. 'Hosianna, dieses soll die Losung sein' is remarkable in two respects. Firstly it consists of 17 short sections, recitatives, arias, chorales and choruses, which gives the impression of a single large-scale work. Secondly the four singers all represent characters. The cantata begins with a solo for the bass, who is Freude (Joy): "Hosianna! This will be our Redemption, for the King has come". The soprano acts as Engel (Angel), singing texts from the biblical story of Christ's birth. Her first solo is on the well-known words: "Behold, I bring you glad tidings of great joy, which shall be to all people". The two characters who react to this news are Demut (Humility), sung by the alto, and Glaube (Faith), sung by the tenor. The bass solos are always accompanied by three trumpets and timpani, whereas the Angel is accompanied by two transverse flutes, in both cases with strings and basso continuo. In the middle we find the only chorale in this piece. It also contains two choruses, or rather ensembles as the score says "alle" (together). In these sections the four singers sing unisono. They end the cantata with "Hosianna!". The second cantata for the first Christmas Day is 'Uns ist ein Kind geboren', which is scored for three voices: soprano, alto and bass, with again three trumpets and timpani plus strings and basso continuo. The text is by Erdmann Neumeister, whose cantata texts were also frequently used by Johann Sebastian Bach. The cantata begins with a chorus which is interrupted by solo sections. This is followed by a chorale: Ein Kindelein so löbelich. Next are a recitative and dacapo aria for alto, after which we hear a second chorale: Wir Christenleut hab'n jetzund Freud. Then the soprano sings a dacapo aria, and the cantata concludes with a repeat of the opening section. The third cantata, 'O Jesu Christ, dein Kripplein ist', was written for the second Christmas Day. It has a symmetrical structure: chorale, aria, recitative, aria, chorale. The scoring is soprano, strings and basso continuo. In the two chorales she is joined by alto, tenor and bass. The first chorale says: "O Jesus Christ, your little manger is my paradise". Both arias refer to human suffering, and this is reflected in the string parts, in particular in the use of chromaticism. The closing chorale links up with this: "You who languish in great distress, behold, here is the doorway to true happiness". The disc begins with one of the many orchestral suites by Telemann, scored for strings and basso continuo. As the title suggests this work has a strongly pastoral character. There are no great contrasts between the various movements. In the first, the 'ouverture', bagpipes are imitated, and the piece ends with a section called 'Carillon'. The last item on this disc is a sacred concerto by Christoph Bernhard. He is first and foremost known as a pupil of the most famous German composer of the 17th century, Heinrich Schütz. He wrote some treatises, which found a wide circulation throughout Germany, and these are generally considered reflective of the views of his teacher. He started his career as an alto singer in Dresden, worked for some time in Copenhagen and later in Hamburg, and in 1681 he was appointed Kapellmeister in Dresden. 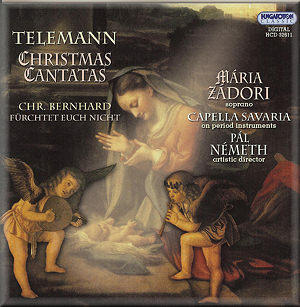 The piece recorded here is very different in structure from Telemann's cantatas. It is a specimen of the 17th-century German sacred concerto: it begins with an instrumental sonata which is repeated as a ritornello between the vocal sections, scored for soprano. The texts are all from the Bible: "Behold, I bring you glad tidings of great joy", "For unto you is born this day" and "Glory to God in the highest". I have already stated that this disc is perfect. What we have here is an ensemble which fully understands how German vocal music of the 17th and 18th centuries needs to be sung. There is no excessive vibrato here, the articulation and phrasing is outstanding, and so is the German pronunciation. The recitatives are performed in truly speechlike manner. The instrumentalists equally show they are fully aware of the content of the vocal pieces. They also give a nice performance of the Overture à la Pastorelle. If you would like to purchase a disc with baroque Christmas music which you haven't heard many times before, this is the disc to seek out. It contains first-rate music in excellent performances.